This is my favorite bag/purse I've made so far. I found the fabric at JoAnns, and it just jumped into my cart and begged to be taken home. In fact, I usually only buy a half yard of any fabric I like, but I bought a whole yard of this one. 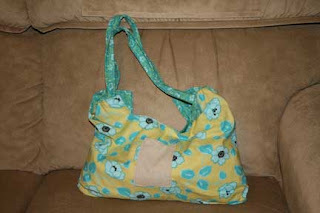 I used the Charming Handbag pattern from Bend the Rules Sewing by Amy Karol, but followed the suggestion of making it larger for a tote size. I copied the pattern at 200% on the copy machine, and then adapted the strap dimensions accordingly. I added a strip of flannel to the inside of the strap, thinking that it would make it softer on my shoulder, but instead it just twists and wrinkles up. I wouldn't do that again. I made pockets out of osnaburg fabric for both the inside and outside. The outside pocket I measured to specifically fit my cell phone, but my husband pointed out (after I'd finished the project and wasn't going to start over) that without a flap to button down that my cell phone would slip out every time I lean over. And it does. I tried carry this bag as a purse for several months and I loved the way it looked, but I have trouble with floppy bags that don't close. I had trouble finding anything, and I couldn't put it on the floor because everything could fall out. I suggest a closure of some sort if you're going to carry this size as a purse. As a tote bag, I love it though. I can throw in a notebook and a book or two along with some pens and I'm set. (That's what I need from a tote, really.) It's not big enough to be my library bag (we check out far too many books for that), but it's perfect for a small project. I'm sorry this photo doesn't show the scale very well. It's a small tote or large purse size, if that helps at all.